It is possible to remove a single instance of Directory Server without uninstalling all other instances, removing an Administration Server instance, or removing the packages. The remove-ds.pl script removes any related files and directories if the -a (all) option is specified. But the Directory Server instance is not unregistered from the Configuration Directory Server. By default, the key and cert files are left in the instance configuration directory, and the configuration directory is renamed slapd-instance-name.removed. Using the -a option (as shown) removes the security databases, as well. If there is a problem with the Directory Server, like the installation failed or the server cannot be restarted, then running remove-ds.pl script fails. In this case, try the -f option to force the removal process. It is possible to remove both the Directory Server and the Administration Server (if configured on the same system). The -y option is required for the script to perform the removal operation. Otherwise, the remove-ds-admin.pl script performs a dry-run but does not remove any servers. The -a option is not required, but it is recommended if a Directory Server or Administration Server instance may be re-configured on the system later. By default, all of the security databases are preserved by the removal script. The -a option removes the security databases, as well. The Directory Server instance must be running for the script to bind to the server. If there is a problem with the Directory Server, like the installation failed or the server cannot be restarted, then running remove-ds-admin.pl script fails. In this case, try the -f option to force the removal process. 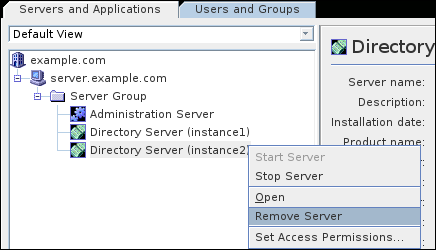 Right-click the server instance, and select Remove Server.